Cleaning your hardwood floors is an important household task and can make all the difference to how you feel about your space. Not only that, but it’s also important to your home’s value that your floors stay in good shape. Regular cleaning with an excellent cleaner like the Bona hardwood floor cleaner is the best way to keep your floor investment safe. Hardwood floors are one of the most popular features in the modern home because they are much easier for people with allergies than a carpet, look amazing, fit any style of decoration, and are very durable. Over time, though, your hardwood floors can deteriorate. With the wrong cleaners, they can even warp. That’s why we’ve gone in-depth to look at the Bona hardwood floor cleaner and see how it performs. We’ve also done a comparison with a couple of other good hardwood floor cleaners to help you make the right decision about which cleaners are best for your home. What is Bona Hardwood Floor Cleaner? This excellent product is a favorite among hardwood floor owners. Bona has been in the business of cleaning hardwood floors for nearly 100 years, and that kind of expertise and experience is clear in their product. Most hardwood manufacturers, cleaning professionals, and floor refinishers recommend Bona hardwood floor cleaner. People who know hardwood floors and work with them often almost universally recommend Bona, and it is the gold standard to which they usually compare all other cleaners. Bona hardwood floor cleaner cleans hardwood floors and restores them to the natural shine and beauty they had when they were first installed. This product is especially excellent at removing dust, grime, and dirt. 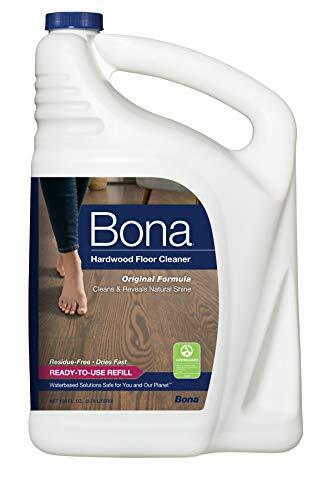 Bona hardwood floor cleaner won’t take a dozen passes to do the job, either, and you’ll notice an immediate difference with scuffs. As a bonus, Bona hardwood floor cleaner has Greenguard Gold certification as safe to use in the home around children and pets. You can buy the trigger bottle by itself or purchase the entire system, which includes an ergonomic mop, microfiber dusting pad, and a washable cleaning pad. You can get a three pack of the spray bottles coming to 96oz for around $31. Once you have the spray bottles, though, you can buy 128oz refill bottles for a couple of dollars less. Bona’s product is very easy to use. The trigger spray bottle is simple to operate and allows you to target small spots as well as spray over large areas. It dries pretty quickly and leaves no residue. The cleaner does all the work for you, cutting effectively through dirt and grime and getting rid of scuff marks almost like magic. Most users report they don’t notice any streaks or residue when they’re done. Bona sets the standard here for most floor cleaners with its Greenguard Gold certification. It’s non-toxic, safe for the environment, and safe for your kiddos and pets as they wander around on the floor. Scuff removal is what the Bona hardwood floor cleaner is most famous for. Where other cleaners can be effective at getting up dirt and grime, removing scuffs is a very different matter. Bona’s product excels in this area. Remember, deep scuffs and scratches will never be removed with a simple cleaner, but for most of your ordinary floor scratches, Bona can do the job without too much effort. Here again, Bona leads the pack. Besides its Greenguard Gold certificate, Bona has also earned a place as the top recommendation from Good Housekeeping. They are also the NBA’s official hardwood floor cleaner. Bruce Hardwood & Laminate Floor Cleaner is made by Armstrong and is specifically designed to help you clean polyurethane hardwood floors and laminate floors. While it can be used on bare wood, it’s definitely meant to be used on woods covered in polyurethane or laminate. Buy a two-pack of the spray bottles to get 64oz at about $20. Once you have the spray bottles, you can get a two-pack of 64oz refills for about $25 bucks. This is also an easy-to-use product that does not require rinsing. Simply spray it on a targeted spot or largely to cover big swaths of dirty floor at once. We docked one star because you may need to purchase a separate top coat finisher product if you have older floors. 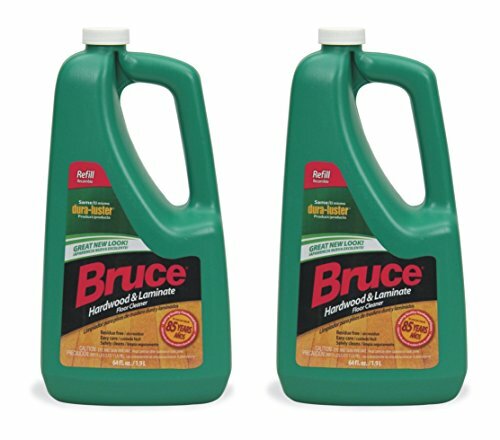 Bruce’s product is also safe for children and pets. It’s biodegradable and can be used in almost any home environment. Bruce hardwood cleaner does not perform quite as well for scuff removal as Bona. It will do a decent job, and it’s excellent for urethane-based hardwood floors. For regular hardwood floors, though, you will not see quite the same stellar results in getting rid of the scuffs. It also takes more passes to get the job done than with the Bona hardwood floor cleaner. This product also comes highly recommended by Good Housekeeping. It’s commonly used among professional house cleaners because of its combination of power and price. 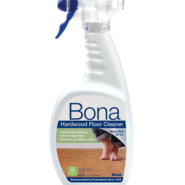 It doesn’t earn the raves that Bona does; but then, no other hardwood floor cleaner does. 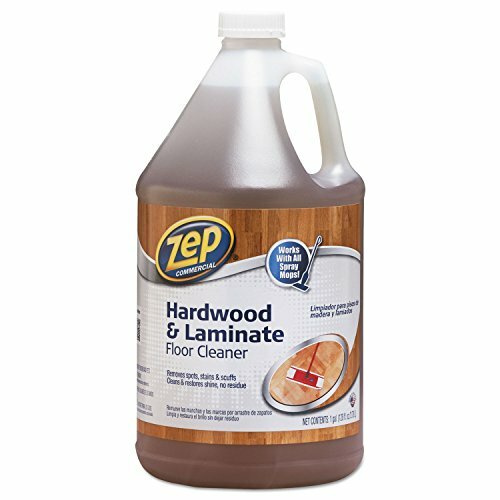 Zep Commercial Hardwood and Laminate Floor Cleaner is sold as a commercial product, but that doesn’t keep plenty of individual customers from using this product on both hardwood and laminate floors. It’s versatile, as it can also be used to clean cabinet doors and crown molding. Zep’s product is not recommended for use on wood floors that have been finished with oil or requires waxing. For around $11 you’ll get a four-quart, or 128oz, bottle at Lowes. As this is a commercial product, you must decant it into a spray bottle if you want to spray it around. Once you do that, you’re good to go. However, it requires a lot more passes to get the job done and really struggles at getting rid of dried-on messes. It does not have to be diluted and can be used in a spray mop. Officially, it’s an eco-friendly product. However, it does not have the same ratings for biodegradability as Bruce’s product or the official certification that Bona enjoys. Proceed with caution. Zep does a good job removing scuff marks though it may require more passes to remove the marks. Zep has not earned any of the official recommendations that Bona or Bruce have eaned. Good Housekeeping gives it only three out of five stars and reviews from individual users are mixed. 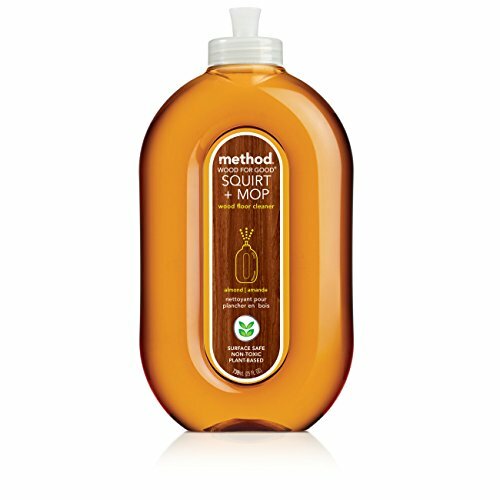 Method Squirt + Mop Hardwood Floor Cleaner is the only all-natural, plant-based formula we looked at. The emphasis here is on the environment and the safety of your family, but not so much on cleaning the floor. This does not mean it does a poor job, however, and one of its plus points is the lovely almond smell it leaves behind. If you don’t like the almond scented floor cleaner, you can also get it in a lemon ginger scent or in spearmint sage. You definitely pay more for this eco-friendly option, as certain scents are more expensive than others. The almond scent will run you about $30 for 25 ounces. The spearmint sage scent will run you over $40 for the same amount on Amazon. You can get refill bottles of 68oz for about $10, but only in the almond. Squirt it on the floor and then mop. No rinsing is necessary, and it can be used on both hardwood and laminate floors, though it’s not suitable to be used in a spray mop. Although the company has been working on improving their nozzle, a squirt nozzle will never provide the same coverage as the spray triggers offered by Bona and Bruce. In addition, it’s not great at removing sticky messes on your hardwood floor. It literally gets no more environmentally friendly than this product. It’s certified as cruelty-free, meaning it’s not tested on animals, and the bottle is made from 100% recycled plastic. It’s derived from all-natural, non-toxic ingredients and is biodegradable, so you can rest easy that your children and pets are perfectly safe crawling around on a floor cleaned with this product. Although this product is not great for sticky messes, it does a great job on scuff marks. It only takes a few passes to get rid of them, likely because of the natural oils in the product. It needs a few more passes to do the job than Bona does, however. As with Zep, Method has earned no official recommendations other than the B Corporation recommendation for the entire company as being good for the planet. Reviews on Amazon and other similar sites are positive, though mixed, and some reviewers complain that it leaves a streaky film or a sticky floor. All the cleaners we reviewed will clean your hardwood floor. Some of them, such as Zep, will require more elbow grease on your part to do the job. None of these products are toxic or known to be dangerous, but only Bona hardwood floor cleaner has the Greenguard Gold certification, and only the Method cleaner is made with all-natural ingredients. Some of them, such as Bruce or Zep, may require you to use an additional product to get the clean and shine you want from your hardwood floors. There are several reasons that Bona hardwood floor cleaner is the gold standard for this type of cleaning product. It’s inexpensive, environmentally friendly, and works on all hardwood floor types. It’s easy to use and does a great job of cleaning up sticky messes, stubborn scuffs, and even dried on messes. It’s the official cleaner of the NBA and highly recommended by everyone who knows and loves hardwood floors. You can’t go wrong with Bona hardwood floor cleaner, and we give it five stars.